I honestly can’t decide whether I like After Dark. 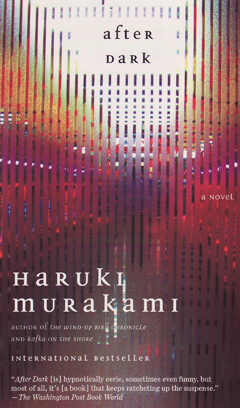 With a few major exceptions (like “Barn Burning”), I don’t like Murakami’s short stories. According to several interviews, Murakami considers himself a novelist and primarily uses short stories as practice. Although his short stories are more polished than he gives himself credit for, I can understand why Murakami would say that. Compared to the huge imagination and forceful imagery of his novels, Murakami’s short stories tend to feel somewhat shallow. To me, After Dark felt more like a short story than a novel. Perhaps the problem is the length of the book. Weighing in at approximately 250 double-spaced pages, Murakami’s latest novel should perhaps be more properly considered a novella. Another consideration might be the novel’s timeframe. The main action of After Dark takes place in the span of seven hours. To be precise, it starts 11:59pm and ends at 6:52am, as the chapter headings (each labeled by hours and minutes) inform us. Within this short period, the reader learns a great deal about the book’s protagonists, including a brief outline of the more sordid highlights of their pasts. Unfortunately, I was so entranced by these characters that I found myself wanting to know more about them. I wanted to see them in action, I wanted to hear their voices, and I wanted to see them standing around cooking spaghetti. I wanted to learn their life histories slowly, and not in bullet points. My main concern with the book, however, was the treatment of what I like to call the “Murakami myth.” A recurring theme throughout almost every Murakami novel is the woman who disappears into the neverland of her unconscious. After Dark’s disappearing woman takes the form of Eri Asai, the older sister of one of the two protagonists. Eri, who has fallen into a deep sleep from which she will not wake, is the subject of the novel’s even-numbered chapters, which detail the uncanny events which befall her during the night. Although Murakami never resolves the mysteries surrounding his disappearing women, I felt that After Dark’s Eri subplot was more undeveloped than usual. In fact, it left me quite frustrated, and it felt almost randomly thrown into the main action of the story. Although the Murakami myth generally adds a wonderful level of depth to his novels, I felt that, in this case, it was a misguided attempt to flesh out a novella that perhaps should have more properly been a short story. That being said, the main action of After Dark is more than interesting enough to justify the existence of the book. In short, two lost souls manage to connect in the late night / early morning hours of Shinjuku. Several passages, such as the description of a Japanese Denny’s and the interactions between the employees of a love hotel, stand out like gems. The vast majority of this book doesn’t sparkle, though; it glows softly like street lamps, or eerily like the static on a TV screen. In other words, this isn’t one of Murakami’s masterworks, but it does have a quiet charm that should appeal even to those of you who aren’t necessarily Murakami fans.